You have to understand the terminology associated with pivot tables. It is the first step to the master Excel pivot table. See the following Figure. Each item in the field occupies a column. In our above figure, Customer represents a column field and Customer contains two items (Existing and New). There may have nested column fields. A row or column that displays totals for all cells in a row or column in a pivot table. Grand totals can be calculated for rows, columns, or both (or neither). The pivot table shown in the above figure shows the grand totals for both rows and columns. A group is a collection of items treated as a single item. The pivot table shown in our figure does not have any defined groups. Item is a field that appears as a row or column header in a pivot table. In our above figure, Existing and New are items for the Customer field. The Branch field has three items: Central, North County, and Westside. AcctType has four items: CD, Checking, IRA, and Savings. Refresh recalculates the pivot table after you have made some changes to the source data. Each item in the field occupies a row. Nested row fields are also possible. In the above figure, Branch and AcctType both represent row fields. Source data is the data that is used to create a pivot table. Source data can in a worksheet or an external database. 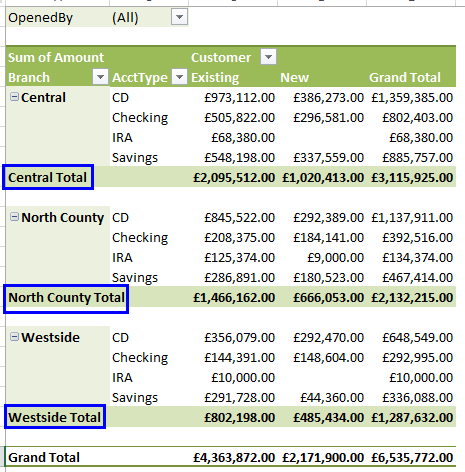 The pivot table shown in the figure displays subtotals for each branch, below the data. You can also display subtotals above the data or hide subtotals. Using a table filter, you can choose one item, multiple items, or all items in a page field at one time. In the figure, OpenedBy represents a table filter that displays All items. Click on it, and you can choose different options to choose from. Values areas are the cells in a pivot table that contain the summary data. 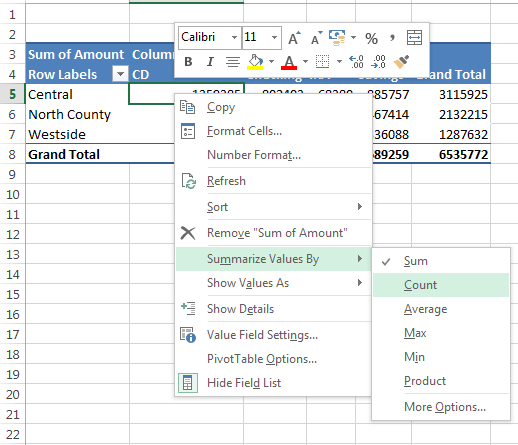 Excel offers many ways to summarize the data (sum, average, count, and so on). Right-click on any value in the pivot table and then use the following figure to change the option. Really, The website from which you interpreting things about excel is excellent !! Thanks Buddy for your contribution on this.